Deer Valley is the fairy princess of Utah skiing – just the perfect fit for skiing families, “the fairest of them all” in any skier’s storybook. Deer Valley is everything you have heard about; rated #1 resort by Ski Magazine readers, for four and five diamond lodging, award-winning on mountain cuisine, ski valets that carry your skis from your car, gorgeous groomers and great service.Snowboarders are not allowed and lift ticket sales are limited to about 7,000 a day to assure everyone has a seat in their luxurious lodges. What’s not limited is the terrain, with five separate peaks spreading over 2,026 acres, 3,000-vertical served by 22 lifts including 11 high-speed quads and a leather-upholstered gondola. See Deer Valley ski photos. Start your day riding The Silver Lake Express to the upper mountain and head for gorgeous groomed cruisers on Bald and Flagstaff Mountains, and powder-filled aspen groves tucked in between like Triangle Trees. Kids will love Deer Valley’s adventure zones and on mountain mascots, plus the super friendly Deer Valley Ski School. Empire Canyon is Deer Valley at its peaks, 9,570’, here in Daly’s Bowl this pampered paradise gets double black diamond steep with chutes and tremendous tree stashes. For more mellow terrain, ski the scenic run to Deer Valley’s Jordanelle Gondola passing by magnificent mountain mansions and the St Regis Deer Valley. Deer Valley’s lodging is extensive and elegant, whether you choose the delightful Austrian The Goldener Hirsch or The Lodges at Deer Valley, The St Regis or the swank green Montage at Deer Valley. Deer Valley’s on mountain dining, we recommend going to Burgers and Bourbon at the Montage for ski in ski out lunch at this monstrous ski hotel. For après ski go to the St Regis Terrace Cafe, sip and watch the Champagne Sabering and the Fire Garden spark. 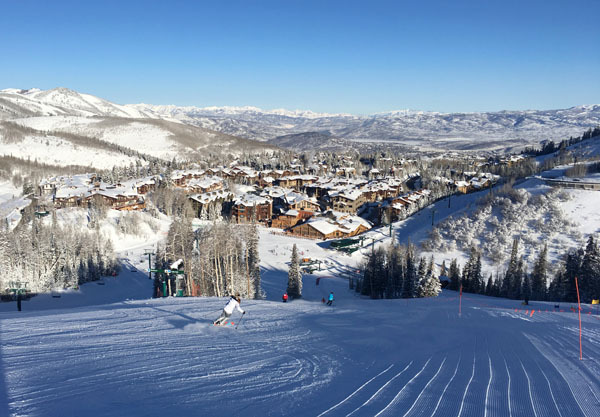 Deer Valley takes splendid care of ski families, as long as there are no snowboarders in your clan – if so they need to hop a shuttle bus to the slopes of Park City Mountain Resort next door. 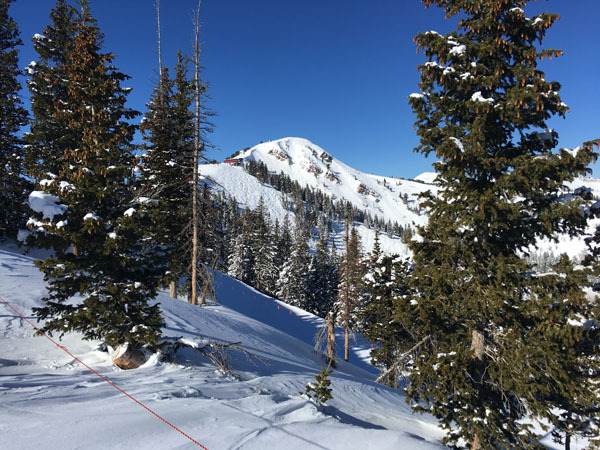 Deer Valley and Solitude Mountain Resort in nearby Big Cottonwood Canyon are now merged with Alterra Mountain Company – an Aspen ski resort collection of 13, part of the IKON pass, so stay tuned for changes to these Utah ski resort.